1. A, B and C started a business by investing Rs. 18000, Rs. 24000 and Rs. 32000 respectively. After one year, A invested 50 % more than the initial investment but C withdraws Rs. 7000. And after one more year, B invested Rs. 6000. Find the total profit at the end of three years, if the share of B is Rs. 97500? 2. Abinav invested a sum of Rs. 40000 on simple interest at 6 % per annum for 3 years. He invested a same amount on Compound interest at 4 % per annum for 2 years. Find the total interest received by him after a given period? 3. A shopkeeper sold an item at a discount of 15 % but he gains 25 %. If the marked of the item is Rs. 25000, then find the cost price of the item? 4. A and B can complete a piece of work in 12 days and 16 days respectively. With the help of C, they can complete the work in 6 days. Find D alone can complete the work in, if the efficiency of D is three times the efficiency of C? C can complete the work in 48 days. 5. The ratio between the radius to that of the height of a cylinder is 1: 3 and the perimeter of a square is 112 cm. Find the volume of a cylinder, if the radius of the cylinder is equal to one-fourth of the side of the square? 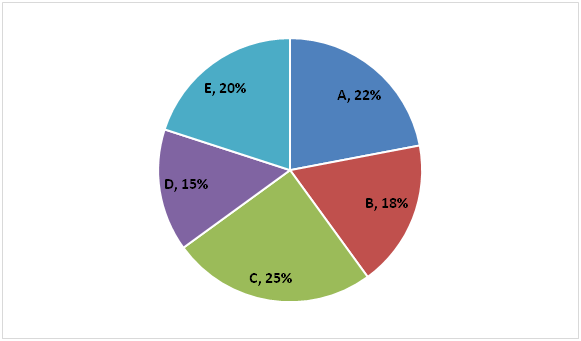 The following pie chart represents percentage wise distribution of Quantity of mixture of milk and water in five different containers. 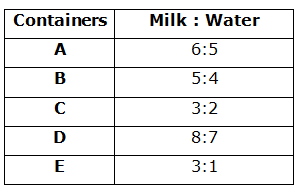 The following table represents ratio of milk and water among them. 6. The milkman sold 44 litres of the mixture from container A and added 5 litres of pure milk and 10 litres of water to remaining mixture. Find the difference between quantity of milk and quantity of water in the final mixture of container A. 7. If mixtures of container B and container E are mixed in a different container F, find the respective ratio of milk and water in container F.
Quantity of mixture in container B = 18/100 x 1200 = 216 litres. 8. Find the average of the quantity of milk in container B, container C and container D.
9. Quantity of water in which of the given five containers is minimum? 10. The milkman added 14 litres pure milk and 6 litres water to container D. He Sold 80 litres of the mixture and again added 4 litres of pure milk and 2 litres of water to the remaining mixture. Find the respective ratio of milk and water in the final mixture. 1) A, B and C started a business by investing Rs. 18000, Rs. 24000 and Rs. 32000 respectively. After one year, A invested 50 % more than the initial investment but C withdraws Rs. 7000. And after one more year, B invested Rs. 6000. Find the total profit at the end of three years, if the share of B is Rs. 97500? 2) Abinav invested a sum of Rs. 40000 on simple interest at 6 % per annum for 3 years. He invested a same amount on Compound interest at 4 % per annum for 2 years. Find the total interest received by him after a given period? 3) A shopkeeper sold an item at a discount of 15 % but he gains 25 %. If the marked of the item is Rs. 25000, then find the cost price of the item? 4) A and B can complete a piece of work in 12 days and 16 days respectively. With the help of C, they can complete the work in 6 days. Find D alone can complete the work in, if the efficiency of D is three times the efficiency of C? 5) The ratio between the radius to that of the height of a cylinder is 1: 3 and the perimeter of a square is 112 cm. Find the volume of a cylinder, if the radius of the cylinder is equal to one-fourth of the side of the square? 6) The milkman sold 44 litres of the mixture from container A and added 5 litres of pure milk and 10 litres of water to remaining mixture. Find the difference between quantity of milk and quantity of water in the final mixture of container A. 7) If mixtures of container B and container E are mixed in a different container F, find the respective ratio of milk and water in container F.
8) Find the average of the quantity of milk in container B, container C and container D.
9) Quantity of water in which of the given five containers is minimum? 10) The milkman added 14 litres pure milk and 6 litres water to container D. He Sold 80 litres of the mixture and again added 4 litres of pure milk and 2 litres of water to the remaining mixture. Find the respective ratio of milk and water in the final mixture.